The Spirited Assembly System (SAS) combines moulded hulls and decks with pre-laminated flat panel construction to achieve a seamless stylish result. The finished craft has the appearance of a production style boat with no resemblance to a typical kit boat. Additional moulded parts are included with these kit packages to fast-track the assembly. Easy set-up A major advantage of this system is that the boat is assembled the right way up. There is no need for a strong back, cutting and setting up temporary frames and bulkheads or turning hulls. In fact there are no temporary frames required in the hulls at all. The moulded hulls and decks help to add support to the longer flat hull panels providing a fair surface to follow. Seamless Fit The moulded hulls and decks are built with a recessed joint to accept the outboard hull side panel which delivers a smooth level join line. These panels are left unfitted until the interior fit-out is complete allowing open access and ventilation for any dusty work. More Cutting The flat decks are supplied with computer-cut hatch openings to any preferred brand and also the daggerboard cases for accurate fitment. The stylish rounded cabin top is built over temporary frames which are fastened to the cabin sides. The cabin top is flat panel plain foam for weight-saving and is fixed to the temporary frames. Material Options These kits are available in Endgrain balsa or foam cores. The moulded hulls and decks are produced using the resin-infusion process. This process uses vacuum pressure to draw the formulated epoxy resin through the fabrics and core material to fully impregnate the part. The extreme vacuum pressure ensures excellent consolidation and avoidance of any air pockets. Any additional reinforcement is laid into the mould where required and is infused together with the part. These sections are supplied with a peelply finish which omits the need for sanding when fitting internals to these parts. Image shows an example of previous parts produced. The Spirited 380 kit is supplied with moulded daggerboards, rudders, engine hatches/gutters and bows. Also available upon request are moulded saildrive engine beds and composite steering wheels. 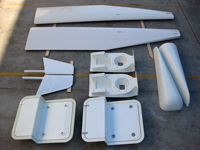 The Spirited 480 kit is available with daggerboards, rudders and engine hatches/gutters. For delivery of the kit packages inclusive of the components within Australia, the moulded components are shipped directly from our factory seperate to the balance of the kit. With export orders, all kit parts are packed into shipping containers at our factory and dispatched directly to the client. An average production time for one of these kits is 6 weeks.